Though their practice and passion may often seem to be at opposite ends of the creative spectrum, a common thread exists between fashion designers to materials engineers. And now a doctoral student at Drexel is modifying that thread and knitting it into a textile that can store electricity. As she prepared to embark for the prestigious Lindau Nobel Laureate Meeting, where she will meet with the greatest minds in chemistry, Kristy Jost shared her journey from sewing machines to supercapacitors with the Drexel News Blog. As a sophomore fashion design major, Jost wanted to make a loudspeaker gown that set the wearer apart from the crowd. After starting her academic career in fashion design, Jost is now pursuing a doctoral degree in materials science and engineering. For Jost, who has used fashion design to express herself from the age of six when she made her own Barbie clothes, through high school when she donned a prom dress of her own design, the idea of making clothing that had unlimited functionalities beyond aesthetic expression opened her to a new world of possibilities that she was anxious to explore. Once Jost began conceptualizing new kinds of smart garments that used multimedia as a form of expression on the body, it wasn’t long before she took the next step into smart textile research advised by Genevieve Dion, the director of the Shima Seiki Haute Technology Laboratory, in 2009.In her junior year Jost completed a research co-op between design and engineering. In Dion’s smart textiles lab, Jost conducted a research co-op between design and the lab of Dr. Yury Gogotsi in the A.J. Drexel Nanotechnology Institute, where she was introduced to carbon nanomaterials – which, she realized, would be the key to making her high-tech fashion designs a reality. Jost’s senior fashion collection drew its inspiration from carbon nanotubes. This newfound interest in materials science manifested itself in Jost’s senior design fashion collection, which included dresses inspired by the shape and structure of carbon nanotubes and used unconventional materials such as neoprene and nylon horsehair. What began as a pie-in-the-sky idea by Jost as a sophomore fashion design student became a fork in her academic career path when she graduated in 2011 and decided to stay at Drexel to pursue a graduate degree in materials science and engineering. Now, as part of the research teams in the A.J. Drexel Nanotechnology Institute and the Haute Tech Lab, Jost is trying to find the right pattern of threads and materials that will turn her textiles into efficient energy storage devices in order to power various electronic garments.In the nanotechnology lab, Jost coats knitted carbon fiber with carbon materials to produce fabric supercapacitors. She has been steadily testing and refining this procedure for the last two years and has gotten it to the point where it has sufficient energy to power a cell phone. Her work has already been accepted for publication in Energy & Environmental Science, the top journal in energy. Digital knitting machines in the Shima Seiki Haute Technology Laboratory have allowed Jost to turn her nanotechnology research into fabric that can store energy. 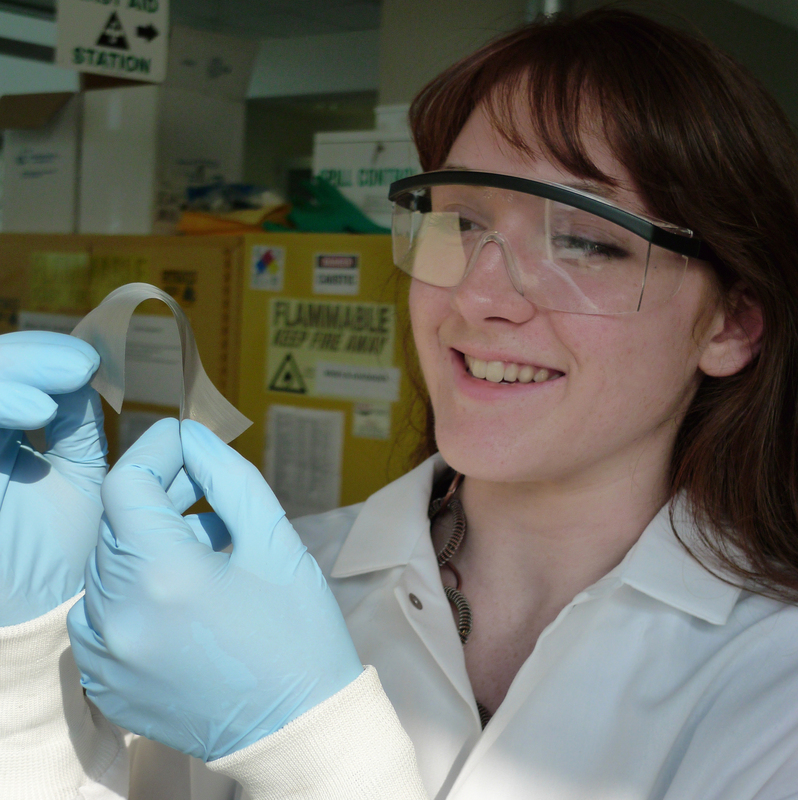 Her latest work focuses on combining all the elements of a supercapacitor into a single thread. 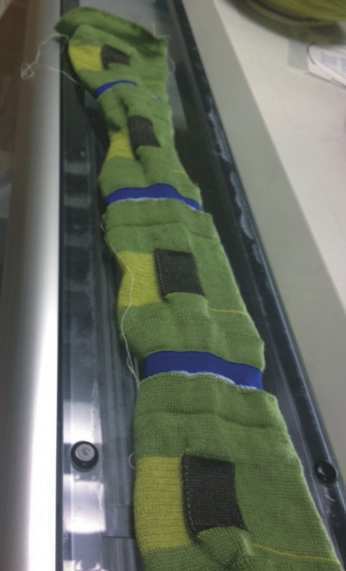 With the precision design capabilities of the digital knitting machines in the Shima Sieki Haute Technology Laboratory in the ExCITe Center, Jost’s thread can be knitted into a smart fabric capacitor that is part of a full garment. A small swatch of fabric made from engineered yarn, could turn an ordinary shirt into an energy storage device. Jost estimates that a 1,000 sq. cm. swatch of smart fabric, created using her method for knitting a carbon fiber supercapacitor, could power a cell phone for one hour. Other knitted technologies from the Haute Tech Lab could one day turn a tee shirt into a monitoring device for hospital patients, make a belly band that keeps track of uterine contractions or maybe even power Jost’s “loudspeaker gown.”But there’s always room for improvement, she says – like finding a ways to charge her capacitor by collecting energy from motion, body heat or passive radiation, energy harvesting technologies embedded alongside her supercapacitor. And it is with these questions that she approaches the Lindau Nobel Laureate Meeting for chemistry at the beginning of July. These meetings of the greatest minds in the world have been held in Lindau, Germany since 1951 as a way for the brightest young scholars to connect with and learn from Nobel Laureates. While Jost’s academic journey might seem to be an unconventional one for a fashion designer or an engineer, it is a trail of multi-disciplinary innovation and discovery that continues to be blazed by Dragons. Fabulous Kristy, congratulations! All the very best from Jim and Kev at the DCC.